Material: Lightweight Cotton Poly Jersey 60% Combed Ring-Spun Cotton and 40% Polyester. 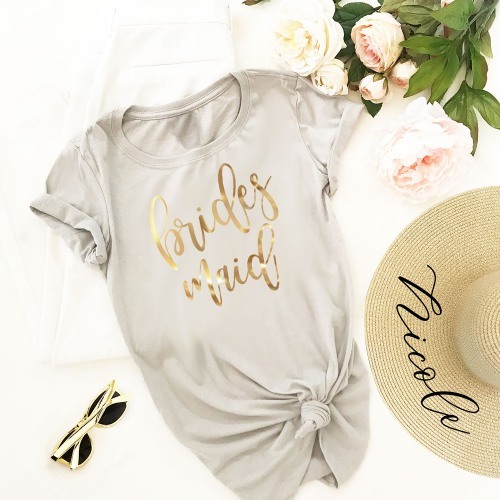 The Bridal Party T-shirts make a fun and stylish bridal party gift. Party in style with your bachelorette squad with these soft cotton jersey shirt. Each shirt has a crew neck with short sleeves and is printed with a bridal party title and text color of your choice. Sizing: Shirts are a women?s FITTED style Material: Lightweight Cotton Poly Jersey.60% Combed Ring-Spun Cotton and 40% Polyester. CARE INSTRUCTIONS: Wash inside out, gentle cycle, cold water, tumble dry low.